Purple cabbage (also known as red cabbage) once used in traditional recipes, is gaining popularity in food preparations for the variety, colour and nutritive value it adds to a dish. Its rich fiber content eases digestion and prevents cardiovascular diseases. The high potassium composition is also important to maintain optimal electrolyte balance. Vitamin A and C also form a high percentage of purple cabbage. Vitamin C enhances calcium absorption, helps for collagen and is an active antioxidant. However, exposure to heat destroys vitamin C and hence it is only the raw cabbage that is rich in Vitamin C. The amount of Vitamin A present in a purple cabbage provides 20 percent of the daily vitamin A requirement recommended for Indians. Vitamin A aids in maintaining vision, reproduction and skin health. 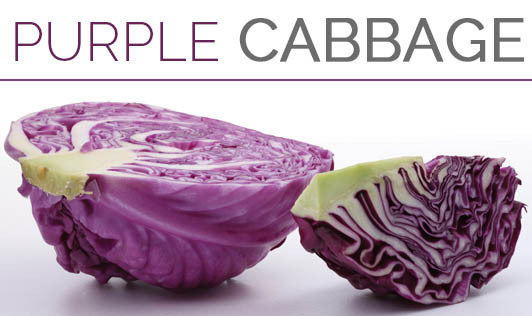 Apart from this, purple cabbages are rich in polyphenols. It is simple to incorporate purple cabbage in your recipes. You can use them just as you use the usual cabbage leaves. Raw purple cabbage leaves can be used in salads, juices and sizzlers.